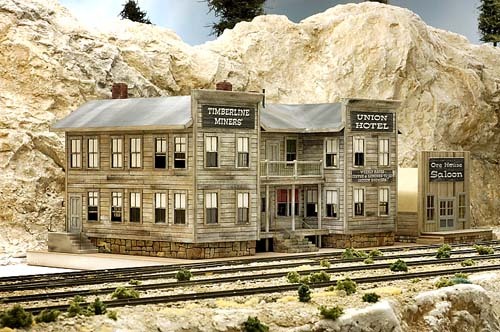 The Miner's Union Hotel is an imposing, scratch built structure that is located in the high mountain community of Timberline on my C&TT RR. 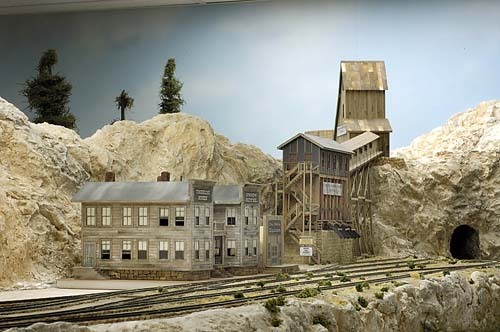 It serves as a large boarding house for the miners who work in the nearby Timberline Lead and Zinc Mine. 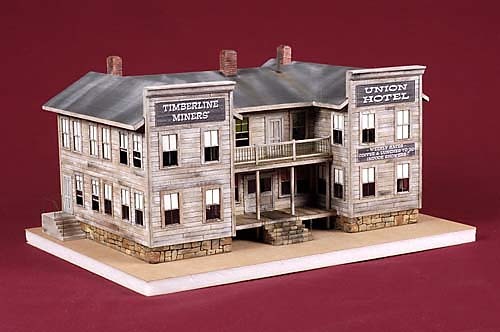 While this document will highlight some of the construction techniques and details of the hotel, a more thorough description of the process can be found in the article titled, "Building The Timberline Miners' Union Hotel," that appeared in the February 2012 issue of Railroad Model Craftsman magazine. 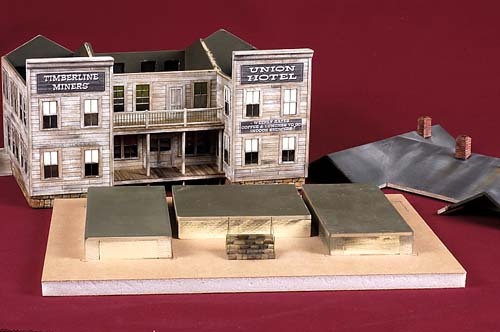 The structure is made up of three major components, a removable Gator Board base with alignment pieces for the three interconnected building units, the complete building component and the complete roof that features edge trim and three metal chimney castings. The three building units were first constructed with untempered Masonite. Before gluing the walls together, window and door openings were cut out with a right-angle punch. I tried something different to create the foundation stones. A grinding tool was used to create a 1/16" dato along the bottom edge of the outer walls. The milled away space was then filled with Squadron White Putty and smoothed flush with the surface of the wall. When dry, the mortar lines were carved with dental tools. The entire stone foundation was painted with black craft paint, then the face of each stone was dry brushed with tan colored paints. 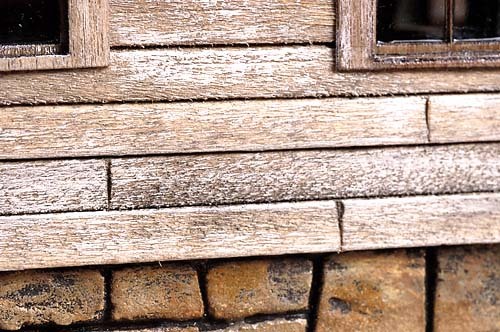 Bass wood siding strips were cut on a precision saw and applied one board at a time to the Masonite side panels so that the pieces extended slightly beyond the faces of the foundation stones to prevent water damage. 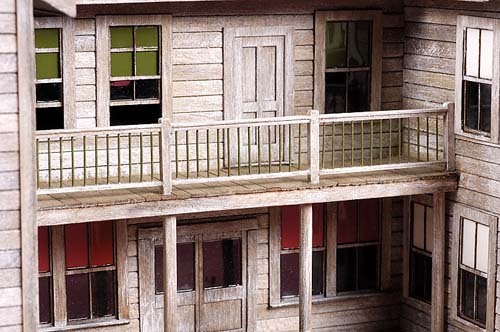 The front porch and second floor balcony were made using the technique described in , "Building Loading Docks." The intricate railings and balusters were constructed with short pieces of strip wood and brass wire. This photo shows that colored window shades were used for different areas of the Hotel. The front half of second floor of the middle component afforded living quarters for the mine's Chief Engineer and his family. 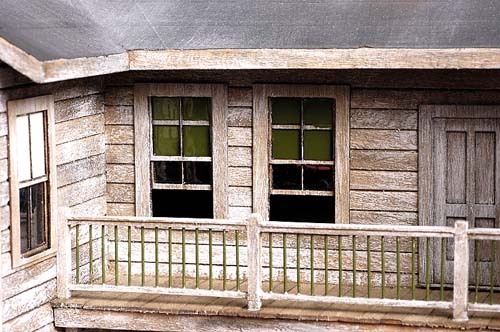 A door is provided for them to use the balcony to relax in the cool mountain air.The rear half of the second floor provided showers for the residents. The front porch is supported by 1/8" diameter dowel rods that extend from the ground, through the decking up to the balcony. Because the lower floor of this component serves as the hotel's dining room, double wide windows were scratch built to allow adequate daylight to enter this area. 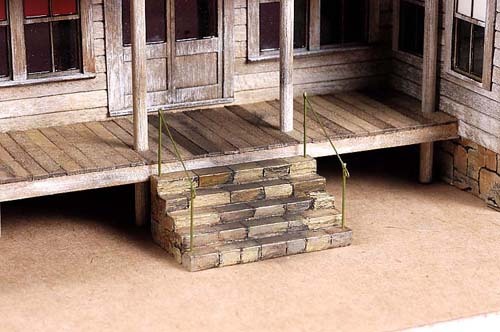 The front steps were made from individual pieces of rectangle strip wood, stacked much the same as a pile of ties. They were covered with a thin coating of the Squadron Putty that was carved to look like individual stacked stones. 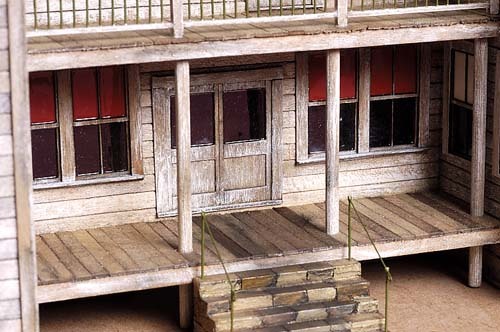 Because they might have become damaged when the building was removed from the Gator Board base, they were not attached to the front porch but glued to the base. 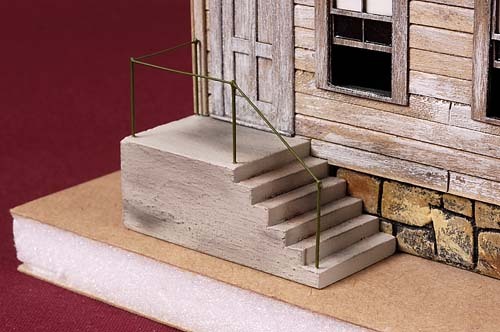 The hand rails for the front steps were formed from brass wire. 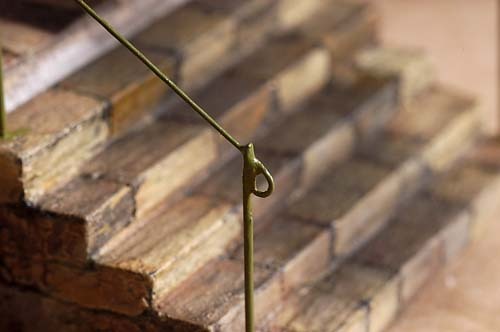 To add a decorative detail, the lower ends of the rails were curled into a loop before being soldered to the risers. 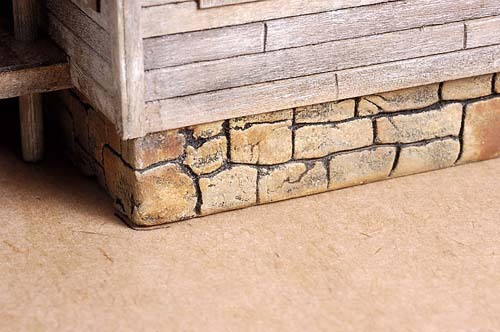 The concrete steps at the rear of each side of the building were cut from a solid piece of oak, then painted with the gritty paint that had accumulated in the caps of the craft paint cap. When dry, it had the rough appearance of concrete. All the signs for the hotel were created with Adobe Photoshop Elements 7. The wood grain pattern of the sign board was made with the, "liquify," feature of the editing program. The curved detail used at the top of the false front is a piece of Crown Molding, normally used to make doll houses. 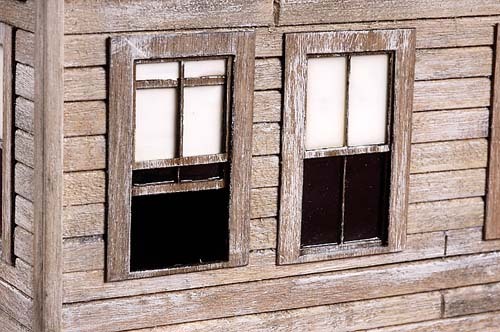 The window shades were painted to the back surface of the acetate glazing. 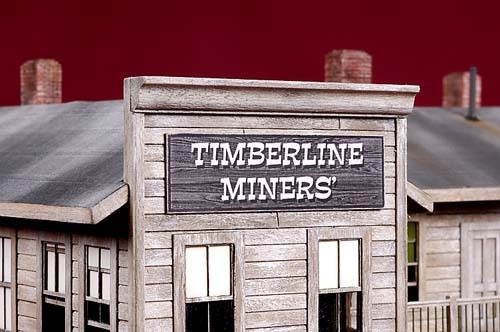 Because the mine operates around the clock, the down position of some of the window shades suggests that miners have completed their shifts and catching some sleep. The window glazing was cut from a piece of acetate page protector material. It was trimmed to size and attached to the window pieces with CA adhesive. When dry and painted, the outer surface was covered with a small amount of Future Floor Wax to produce a wavy appearance on the glass. 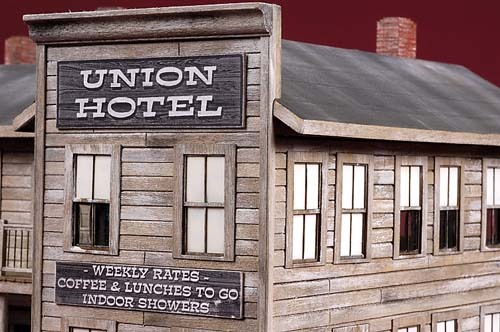 While the back side of the hotel will never be seen while it is on this layout, I decided to take the extra effort to complete it in case it's ever moved and used in a different location. This was a serious consideration because the hotel has more than 51 single wide and 5 double wide, laser cut windows. 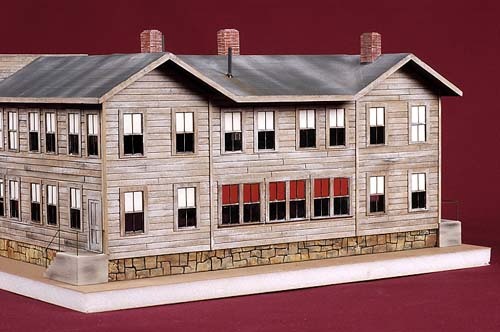 The building was placed in position on the layout. Because of the lack of usuable land in the community, the front steps are a few paces from the tracks. Special trains chartered by the mining company bring miners to the site early Monday morning and carry them down to their homes in the valley late Friday evening. This final view of the hotel shows its close proximity to the tall and imposing Timberline Lead and Zinc mine complex. 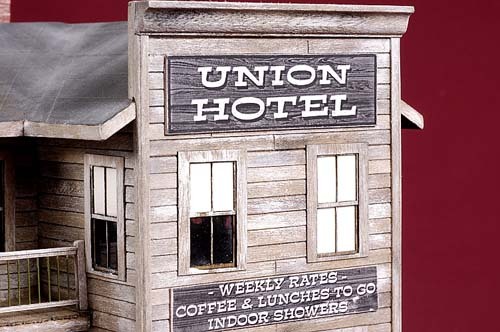 The hotel offers, "Coffee and Lunches to Go," meaning the miners can spend their entire shift underground, only to be lifted up the shaft to walk back to the hotel for a warm shower and hearty meal in the dining area.